For my next few blogs I thought I would tell you a little more about some of the families of birds that are always a favourite of guests visiting us. Whether birds interest our guests or not upon arrival here, the vast majority of people cannot help but be wowed by some of the spectacular species we see here. 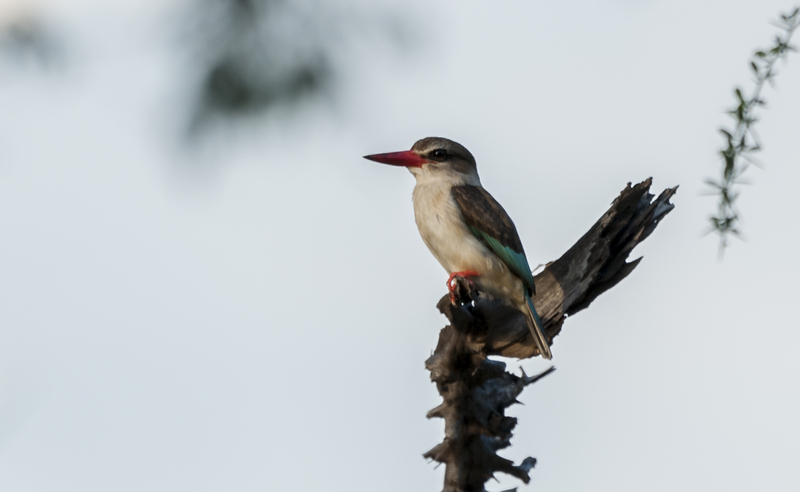 Kingfishers are now split into three families and we have representatives of each of these always delightful birds here in Selous. The name Kingfishers is a little deceptive. It conjures up images of little shiny blue birds dipping into streams for little fish. But actually over half of the worlds 120 species of kingfisher frequent forest and open woodland, hunting mainly terrestrial prey. We see (depending on time of year here) 8 species: all of which apart from the African Pygmy Kingfisher (which amazingly I find has alluded the barrel of my camera lens thus far) are pictured here. 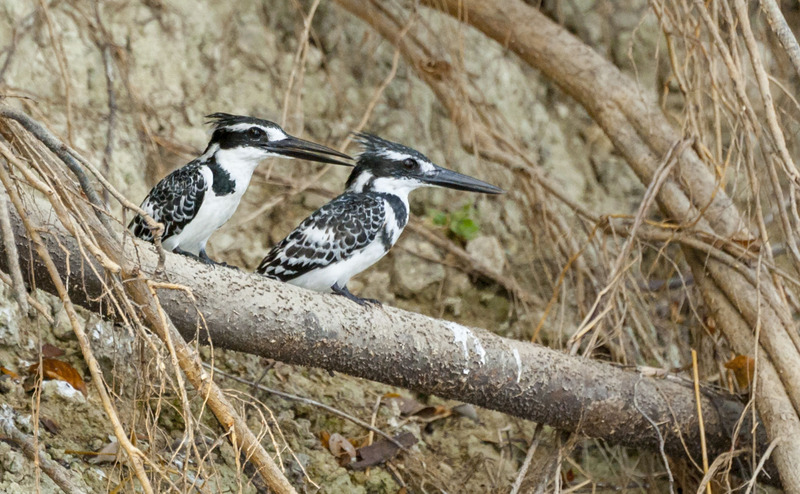 Of the dry land kingfishers, family: Daceloniidae, we could possibly see 4 species, all of which hunt from perches and prey on invertebrates and small vertebrates, swooping down to grab them from the ground. 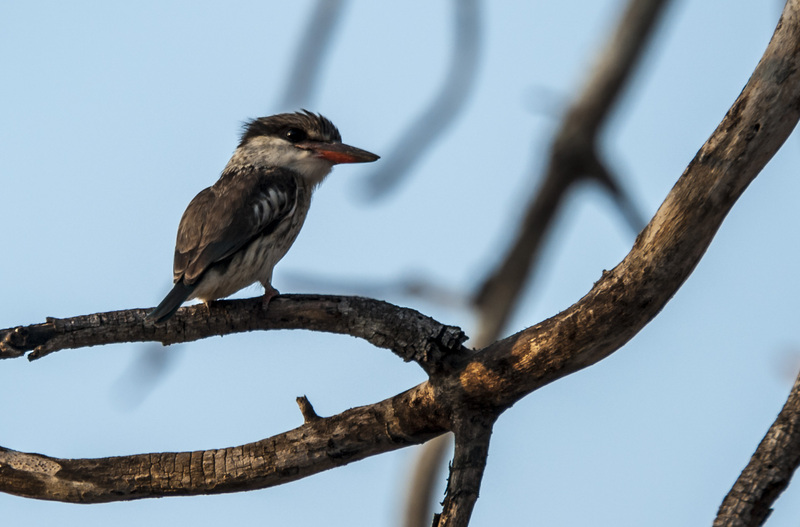 The smallest (and unfortunately the dullest in colour) is the Striped Kingfisher (Halcyon chelicuti) which is resident here and we have a pair who spend a lot of time around camp giving us and guests good opportunities to see and photograph them given a bit of patience. Two more from this group, whom are also residents here, we encounter out on drives in open woodland habitats and they are the Brown-hooded and Grey-headed kingfishers (Halcyon albiventris) and (Halcyon leucocephala) respectively. Which you can tell apart, as you can see in the pictures here, by a key feature of the Grey-headed having a chestnut belly as opposed to the dull off whitish of the Brown-hooded. 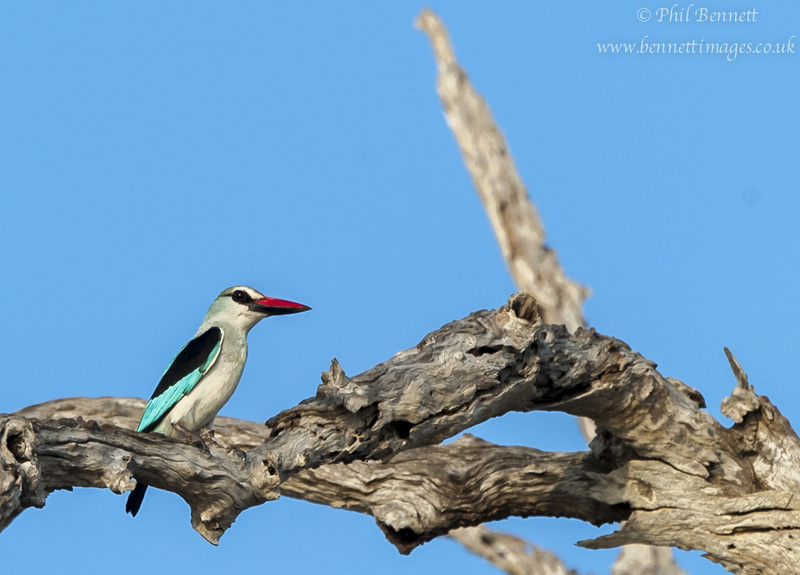 The final kingfisher in this “dry land” group is the Woodland Kingfisher (Halcyon senegalensis). We rarely see this one and only do so really as some stop off here on passage from the African equatorial forest belt down to southern Africa to breed. It is quite a striking bird with its black eye strip and black lower mandible to its bill giving a piratical air. To be honest I am not overly saddened that they don’t stop here for long for (as many of you who have visited southern Africa will know) when in their breeding grounds in the south they call incessantly and disturb the siesta time of many a safari goer and long suffering camp staff. It is the Kingfishers from the families: Cerylidae (large aquatic kingfishers) and Alcedinidae (small Kingfishers) which really capture the imagination though. 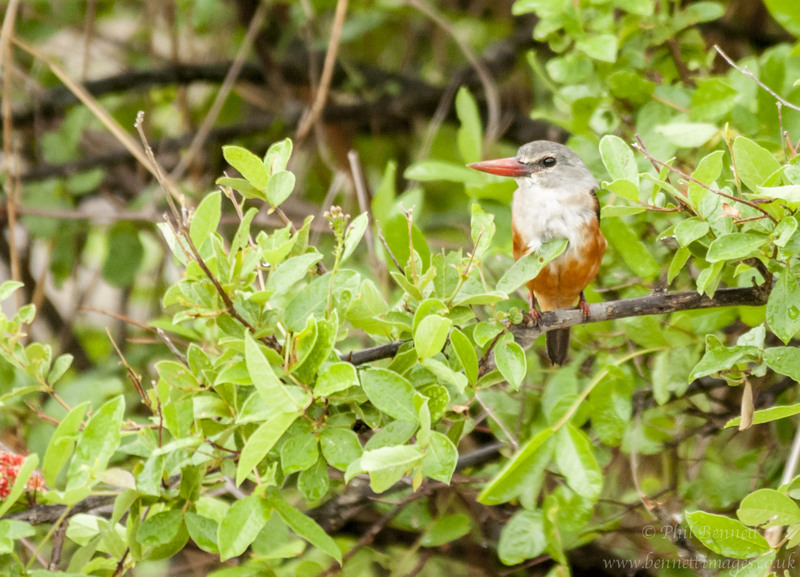 The African Pygmy Kingfisher (Ispidina picta) is, as its name suggests, tiny; it is the second smallest kingfisher in the world (second to the African dwarf –kingfisher of central and west Africa). It’s the only one that we see on occasion that is not pictured here but believe me it is stunning. 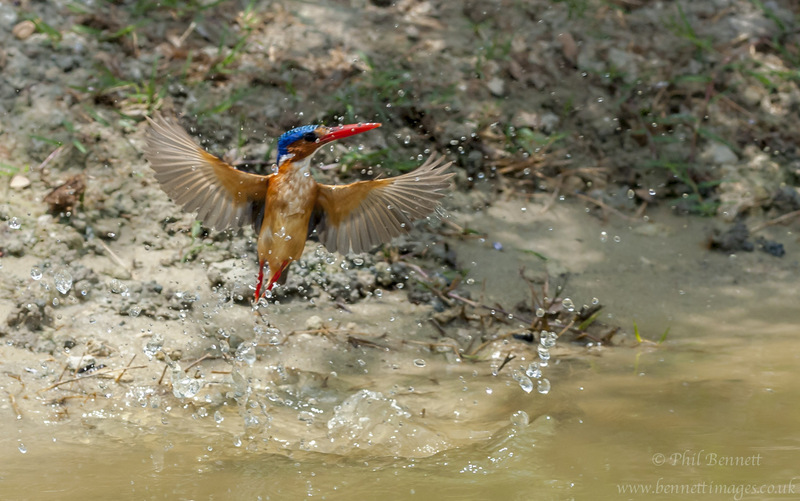 So on to the ones we do see often: The Malachite Kingfisher (Corythornis cristatus) is a favourite and we see them often on the lake, with us able to drift close by as they fish from an exposed perch performing shallow little dives into the water to catch small fish, tadpole and small frogs amongst other things. Watching this never gets old, but is a real challenge for photographers to try to get that perfect shot. The last 2 belong to the group of Large Aquatic Kingfishers. The biggest being the impressive Giant Kingfisher (Megaceryle maxima) whose size is only topped within the Kingfishers by a couple of the huge Kookaburra species from Australia. This is a species we often encounter on the lake perched like a statue on a branch overhanging the lake watching and waiting to plunge in for relatively big fish. The one pictured here is a female who has a chestnut belly whereas the male has chestnut on the chest instead. The one in this picture also has its nictitating membrane covering the eye, which is a feature that helps to protect the eye; handy in cases such as for example: when young chicks sharp bills are stabbing at you in askance of food or to protect the eye when hitting the water at speed. Last of all (I hope you are still with me here) is the Pied Kingfisher (Ceryle rudis) whom even if it is not as stunningly pretty as others is unique in its own way. It is thought to be the heaviest bird in the world able to truly hover without a headwind. And it uses this amazing feat of physicality to hover high above the water, enabling it to fish far from the shore and into the middle of the lake. In places like Lakes Malawi and Kariba in fact they have been spotted hovering over 3km offshore which presents it with a lot of water to fish in. 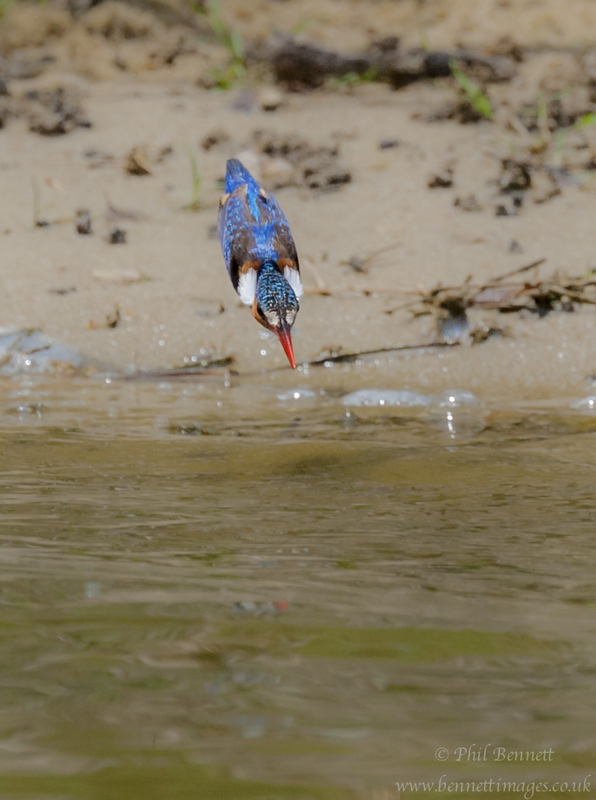 So next time you visit us here at Beho Beho, ask us about kingfishers, we love them. 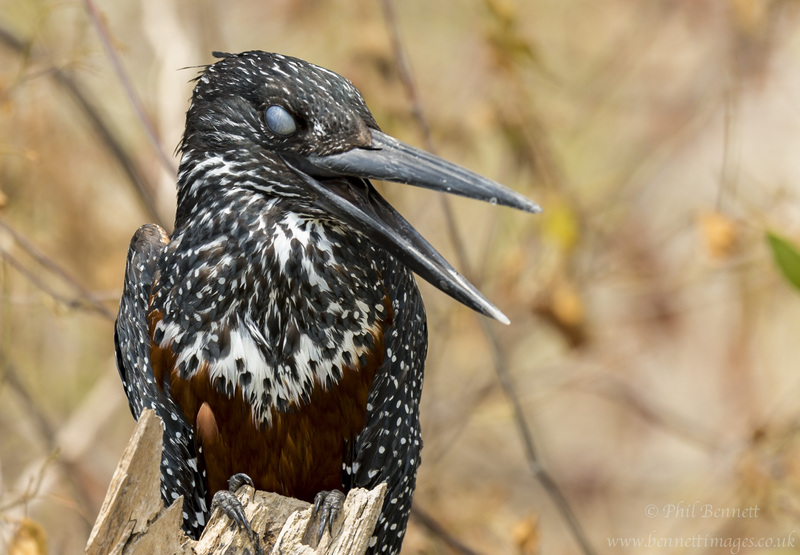 This entry was posted in Phil, Uncategorized, Wildlife and tagged Beho Beho, camp, Kingfishers, Phil, safari, selous. Bookmark the permalink.